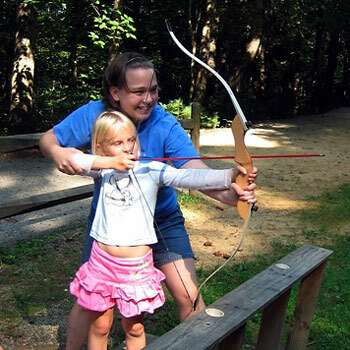 Archery: an activity where campers learn to shoot a bow and arrow at a target. Instructors receive special training established by the National Archery Association prior to camp. Riflery: teaches campers safety protocols and techniques of rifle target shooting. It meets at our covered riflery range. Instructors receive National Rifle Association training and certification. Gymnastics: an activity that teaches general skills on the floor, beam, and bars. It emphasizes flexibility and balance, but accommodates both beginner and experienced campers. Sports and Games: a broad activity that includes both gym sports and field sports. Typical activities include: Basketball, volleyball, dodgeball, soccer, hockey, kickball, and gaga ball. This activity combines basic instruction with an emphasis on fun, teamwork, and creative variations on traditional games and sports. Yoga: introduces campers to poses, motions, and the benefits of yoga. Instructors teach traditional techniques, lead visualizations and work with campers to build confidence and enjoyment through yoga. Tennis: provides campers instruction about the rules and fundamental techniques of tennis. Campers practice skills, play matches, and enjoy silly games for fun. Rockbrook has clay rubico surfaced courts. Swimming: is held in our beautiful mountain spring-fed lake. Counselors work as both lifeguards and swimming instructors. We also have a 75ft water slide campers can enjoy during free swim periods. All swimming staff members hold current Lifeguard and/or Water Safety Instructor certifications. Dance: An activity where campers learn a broad range of dance styles from Jazz to Modern. Instructors help create and lead different routines, tailor moves for different age groups, and choreograph a group routine that can be performed at the end of the camp session. Nature: guides campers in an exploration of the natural world at camp. Instructors design informative age-appropriate activities that teach aspects of biology, botany, animal behavior, geology, and so forth. Staff members also lead field excursions around camp. Curosty: A craft activity focused on various forms of weaving, basket making, and jewelry making. It meets in an historic log cabin by the same name. Folklore: Another craft activity where campers make a variety of items. Popular projects include leather working, sewing, candle making, and soap carving. Staff members teach and demonstrate techniques, and assist campers with their projects. Hodge Podge: A true “hodge podge” of craft activities. These might include making tye-dye t-shirts, batiking, making pillows, and making soap. Staff members often add new project ideas. Needlecraft: teaches campers the basic techniques of knitting, crocheting, and cross stitching. Staff members teach and demonstrate each of these, and assist campers in the design and creation of different projects. Painting and Drawing: introduces campers get to the basics of both painting and drawing. In addition to our studio, this activity often meets outdoors. Techniques taught utilize a wide range of media. KIT: The name is an acronym that stands for “Keep In Touch”. Popular projects include making and sending stationary, decorating memory boxes, and making calendars. Jewelry Making: Making friendship bracelets is the main focus of this activity, but campers also work with beads and rainbow looms to create earrings, bracelets, necklaces, and more. Pottery: a craft activity where campers learn to create pieces of pottery either on the wheel or by hand. It is held in one of our two pottery studios. Staff members demonstrate techniques, and assist campers with building and glazing. All work is fired on site so that campers may take their projects home with them. Drama/Play: encourages campers to explore their dramatic side through role playing, improvisational scenes, skit production, and other acting games. Campers also rehearse roles in a camp-wide play performed at the end of each main session. Instructors lead the campers in the chosen production, assign roles, design sets, choreograph and direct musical aspects of the performance. Journalism: A writing activity for campers to explore various genres of creative writing: poetry, short stories, song lyrics and essays. Older campers can publish a camp newspaper. We collect and publish all writing for our camp yearbook. Horseback Riding: provides campers instruction in the American system of forward riding. The Rockbrook Stables accommodates 28 horses. Staff members teach both beginner and advanced rising classes. Hiking/Backpacking: includes both day hikes and overnight backpacking trips. Hikes may be short excursions to a rock overlook or waterfall on the camp property, or longer trips into the nearby Pisgah National Forest or Dupont State Forest. Instructors lead trips, follow outdoor safety protocols, and care for outdoor gear. Climbing/Alpine Tower: introduces campers to the equipment, safety protocols and physical techniques of rock climbing. It includes climbing our 50 foot Alpine Tower, climbing Castle Rock on the camp property, and out-of-camp trips to other local area crags. Staff members provide climbing instruction, and belaying. Zipline Course: a series of thrilling zip lines and suspension bridges installed in the forest of the Camp property. Staff members follow safety protocols to instruct and lead small groups of campers through the course, launching and receiving girls on each zip. Kayaking: offers campers instruction in whitewater kayaking. Beginning with basic rolling and paddling skills taught at our lake, campers progress to river trips. Staff members provide in-camp instruction and lead out-of-camp trips. Rafting: takes campers whitewater rafting on the Nantahala River. Open to girls who have completed 5th grade or above, trips can include an overnight stay at our Nantahala outpost. Instructors assist with trip logistics, supervise campers at the outpost, and perform raft guide duties. Canoeing: An activity where campers learn the basics of canoeing, play water games, and can take canoeing trips out of camp. Staff members teach at the lake and lead river trips.